The Swabians at Lorinser have turned their style wands on the new Mercedes CL class, with a new aero kit and various add ons including the company's signature aluminum wheels. Not much to say, really, but that the new CL's design economy makes out-tricking a dicey prospect. Luckily the Swabians know something about economy. 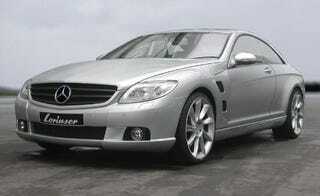 The "great" coup s of Mercedes Benz are traditionally at home were highest demands are honored. The aerodynamic set of the Swabian specialist Lorinser skillfully highlights the new sportiveness of the CL. Especially the striking spoiler bumper with the integrated fog turning lights emphasizes the new design line. The wide side sillboards and front fenders with grill-covered air intakes add a classy touch. The photo shows the CL with aluminum rims of the type Lorinser RS 8.